The Senator, one of the world’s oldest residents, died Monday, Jan. 16. 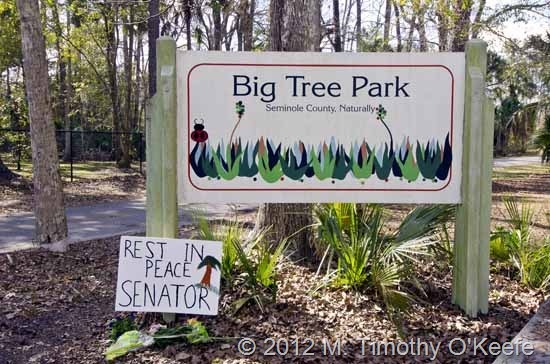 A life-long resident of Longwood, FL, The Senator spent the final days of its 3,500 years as the main attraction at Big Tree Park. 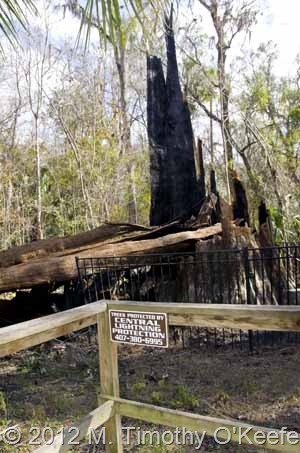 At 125 feet (38 m) tall and with a trunk diameter of 17.5 feet (5.3 m), The Senator not only was the largest cypress tree in North America but was ranked as the world’s fifth oldest tree. Before a 1925 hurricane, The Senator was almost a third taller at 165 feet (50 m). Experts say The Senator was only a sprout when Stonehenge was being erected, iron was being created and China gave birth to one of the earliest civilizations with a recorded history. 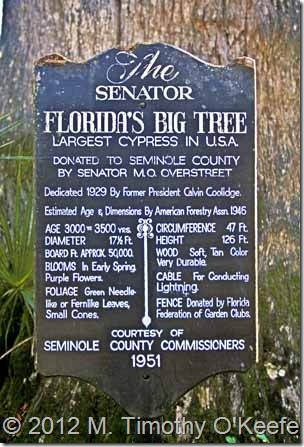 Only four other trees on earth besides The Senator were alive at that time. For those who care about such things, the loss of The Senator is devastating. Death was due a to fire that felled the tree within hours of the arrival of firefighters at around 5:50 a.m. Monday. By 8:15 a.m., the tree had largely collapsed. Most of The Senator was hollow. 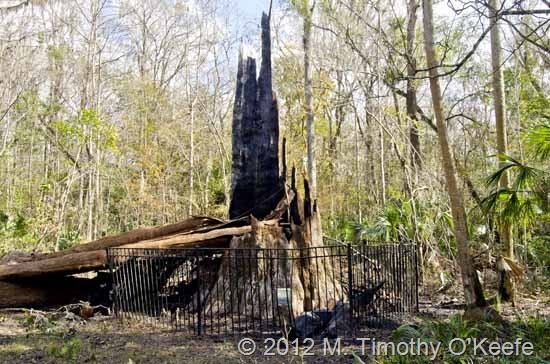 Local media have compared the fire inside the wood cylinder as a blazing chimney fire or the ignition blast of the space shuttle. Cause of the fire is still being investigated. Theories include premeditated murder (arson), a lightning strike that occurred several weeks ago and–the most intriguing of all–spontaneous combustion. Initially, responding fire fighters blamed the fire on arson because twigs and branches were piled near the base of the tree, possibly by a homeless person although Sunday night was mild compared to some previous nights this month. The initial report was that the greatest heat from the fire was at the base. The investigation was quickly taken over by the Division of Forestry whose investigator blamed lightning and apparently concluded that the greatest heat was in the crown of the tree. His theory was that the strike occurred several weeks ago and the tree has been quietly smoldering before breaking out into a full-blown blaze. This would mean that for several weeks no visitor or anyone in the area would have noticed any smell of smoke, a questionable scenario. 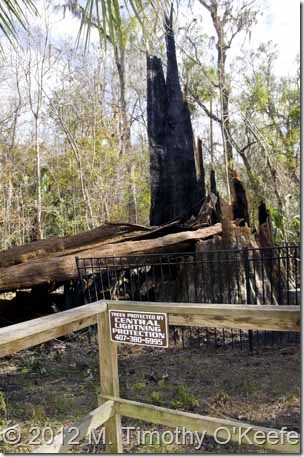 However, blaming lightning brings into question the competence of the company that had installed a lightning rod to protect the tree apparently following a previous lightning strike. The lightning protection company name is prominently displayed at the main overlook of The Senator. Blaming a lightning strike as the cause leans towards libel since it implies (clearly names?) the company as being responsible for The Senator’s death. The spontaneous combustion theory theorizes that the few ancient limbs on the tree because were waving back and forth, creating friction, and thus the fire. Since the limbs were stubs and there was no great wind storm that night, an alien laser might make more sense. The Senator was named for Senator M.O. 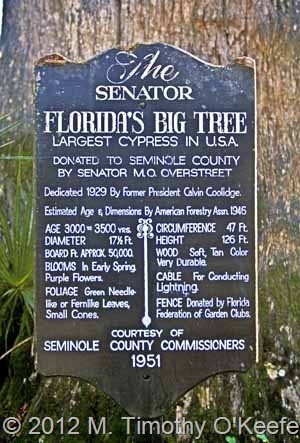 Overstreet, who donated this massive cypress and the land around it to the people of Seminole County in the 1920’s. Until the 1960s, Big Tree Park was one of the area’s most popular attractions for family picnics. Such a big attraction that gift stands sold souvenirs of The Senator. Besides Big Tree Park, the only other local attractions were the swimming pool at Sanlando Springs (now a private community called The Springs) and the Central Florida Zoo (still doing well). 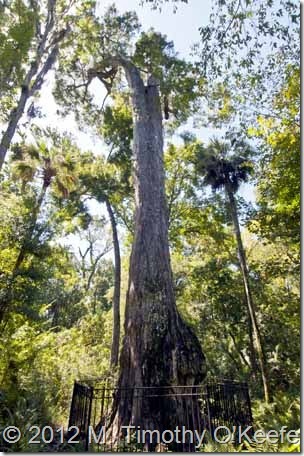 The big question now is what will be done to save the Liberty Lady, a 2,000-year old cypress tree only a few yards from The Senator. With the death of The Senator, at 89 feet (27 m) high, 10 feet (3.0 m) in diameter Lady Liberty is now Florida’s Champion Tree for bald cypress. The age of Lady Liberty also makes it an unusual treasure. Will anything be done to protect Lady Liberty from whatever fate killed The Senator? Not unless there is an armed guard ready to intercept/report whatever happens next. The fence around the park is easily scaled, even by “homeless people” or real vandals. Regardless of the cause, the fall of The Senator is a loss to everyone, anywhere, who cares about protecting the world’s most ancient nature. 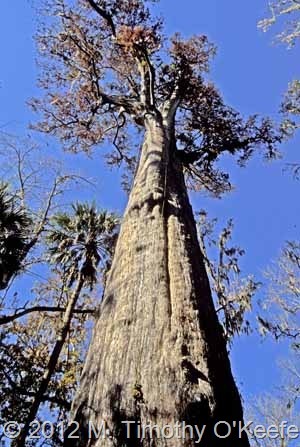 The Senator was one of the last of the Ents (Lord of the Rings). Wading through the various causes of The Senator’s death, it would seem there is a fire bug out there that needs to be squashed.